Don't make it big, make Him big. It is not my long term goal to make it big in the worship or music scene. I am certainly not in ministry for the money, and God forbid that I ever make it about that. It is, however, my intention to make Jesus huge. I want to write music and share songs that help brighten the dark places, and bring hope where there is none. I want to speak life to what is dead and encourage people that they are not alone, and that God is not finished writing their amazing story yet. As it turns out, being a worship leader is a pretty lucrative business. When I was the one in charge of booking special guest artists at our church, I was flabbergasted (my ultimate favorite word) at the high cost of worship. Granted, not all are this way but due to these ridiculous prices, we rarely brought in special music. As for me, I’ve decided that I will never charge a church any certain amount. I never want to put a price on bringing worship music to a church. I feel that it changes the purpose. I understand that a worker is worthy of his wages (1 Timothy 5:18), but I also believe that God takes care of my every need. (Luke 12:27-31). Now, of course I would love granite countertops, travertine floors, a glistening swimming pool, and a lush succulent garden all around my beachfront home (no I don’t have a beachfront home). Those things are not needs though, those are wants. I am in no way condemning people who have those things. Honestly I have to repent an uncanny amount of times when I am on Pinterest as I drool over gorgeous, perfectly put together homes. However, growing up a missionary and pastor’s kid has taught me that God will provide for all my needs, not all my wants, and He makes us content with exactly what He has given us. I have no desire to drive a luxury car to my next women’s retreat or worship conference. I am content getting incredible gas mileage in my Prius thank you very much. Please understand, if God decides to increase my territory in ministry, I would be absolutely delighted. I am amazed at the places He has brought me. From southern California to Australia, and Europe…following Him is truly an adventure. I just never, ever, ever want to put monetary compensation above Him. What is my point? Am I putting down worship leaders or artists that have a set fee? No. Am I criticizing and judging their motives? No. Am I saying that everyone should do what I do? Um, no. I can only speak for myself, and the desires of my own heart. I really can’t sum it up any better than these words written over 100 years ago. Riches I heed not, nor man’s empty praise. Thou mine inheritance now and always. 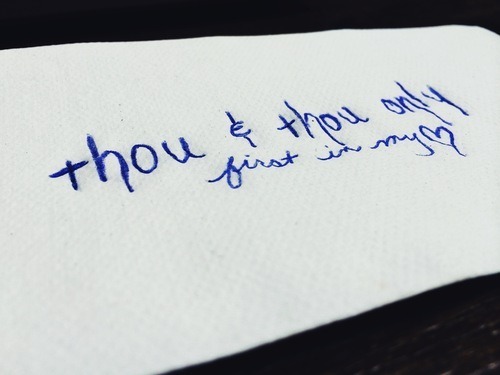 Thou and Thou only first in my heart. High King of Heaven, my treasure Thou art. May my heart always be set on the praise and provision of God. May I always promote Him and His agenda, forsaking my own. May He forgive me for any times I have made it more about me and less about Him. May He take me to places I have never been, to minister to people I’ve never met, to share with them a Truth they’ve never heard, to introduce them to a Savior they never knew. I am His, I will follow, with Him escorting my heart, and steering it along this amazing, adventurous path He has laid out for me.